SPEAK is a grassroots animal rights group currently campaigning to end the use of animals in research carried out by Oxford University. SPEAK is against all animal experiments on ethical grounds and is currently focusing on Oxford University due to the huge numbers of animals suffering inside the laboratories of this well-known institution which can hold over 16,000 animals at any one time. Attention focused on Oxford University when in March 2004 it emerged that the university had started building a new £18 million animal laboratory. This news came just after Cambridge University announced they were abandoning their plans to build the largest primate laboratory in Europe due to a successful campaign run by SPEAC (Stop Primate Experiments At Cambridge). SPEAC relocated to Oxford and changed its name to SPEAK – The Voice for the Animals, and began the campaign to stop the Oxford animal lab. Initially, Oxford University claimed that the new building on South Parks Road was to be an ‘animal hotel’, and that “no experiments would be carried out there and there would be no primates”. However, in March 2004, the university finally admitted that the new facility would be used to experiment on animals, and it also became apparent that not only would monkeys be bred and experimented on, but there would be colonies of monkeys kept inside the new lab. The campaign against this new animal torture centre began with a determination and enthusiasm that has not waned over the years. The first success was gained when in July 2004 the building contractors downed tools and pulled out of building the lab, leaving the building site empty for almost 18 months. Unfortunately the British Government stepped in, determined not to allow another victory to animal rights campaigners and to make sure the new animal torture lab was built – no matter what the cost. They promised to underwrite the cost of building the new lab up to £100 million and gave Oxford University a lot of other support. This support from the Government is not surprising when you consider that the then Prime Minister was an Oxford graduate, as were many who held posts in the cabinet. It also had become clear by this time that despite their promises in their election manifesto of 1997 to work towards the end of animal experiments, the Labour Government was clearly backing research on animals and the numbers being used, particularly in university labs was increasing and they had been very supportive of Cambridge University’s plans to build their lab. In October 2004, after the Government had stepped in with financial support, Oxford University began what would become a very long, drawn out and expensive civil court battle when it sought to impose a draconian injunction on all those legally campaigning against the new lab. At the time of writing, this civil case has dragged on for over four years without a full trial hearing. How ironic that an institution that relies on academic freedoms for its very existence is determined to silence its opponents. The university’s attempts to get all protests within the City of Oxford banned failed, although an exclusion zone was put in place around the new lab limiting demonstrations around the vicinity of the building. Building work on the lab began again in December 2005, with very high security which included an unidentified contractor, anonymous vehicles, builders wearing balaclavas and a security team who were also known to work as mercenaries in Iraq. On top of this, as the campaign has progressed, it has become more and more clear that Thames Valley Police are providing their own private security service for the university, showing a sickening bias towards them at every step of the way and unlawfully arresting protesters at a lawful demonstration. 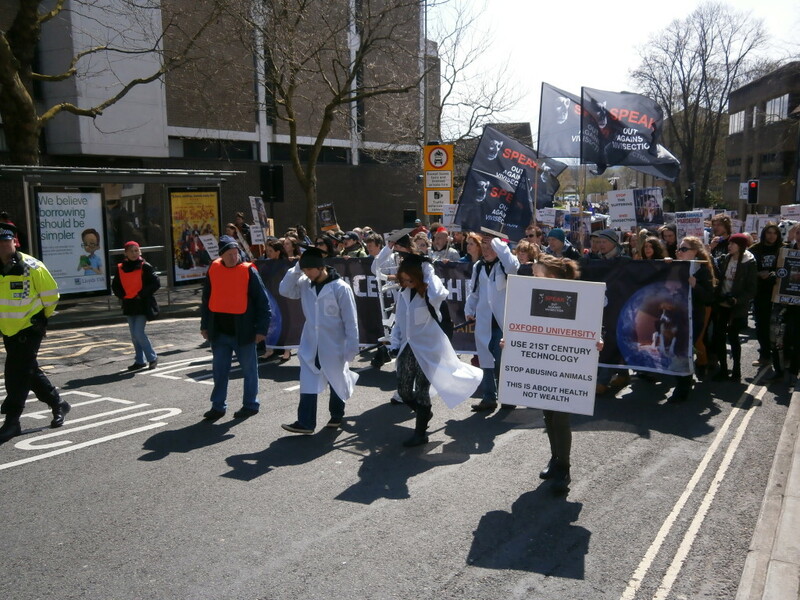 However, this did not deter the campaign against the lab which continued to get increasing support, holding several demos each week, turning up at high profile university events, holding huge marches through the City Centre, taking part in debates, giving school and university talks and holding many information stalls, all of which have put the issue of animal experiments at the forefront of peoples’ minds. On 11 November 2008, Oxford University held a press conference to announce that the lab was completed and that some mice had been moved in. They went on to say that the facility would not be fully operational until the middle of 2009. The result of the SPEAK campaign against Oxford University’s new animal torture lab is that it has cost millions of pounds over the original estimate, the finished building is shoddily built due to the employment of sub-standard builders, the operational use of the lab was delayed for three years, the subject of vivisection and the horrors it inflicts on animals has been a constant talking point in and around Oxford and elsewhere, and anyone else who might have considered building any other new animal research labs in the UK will have been left in no doubt that it would be a bad idea. Now the new torture lab is open SPEAK is focusing on stopping animal experiments at Oxford University, ALL animal experiments, and its resolve to fight for the rights of the animals imprisoned inside its walls is stronger than ever . SPEAK Campaign is not, and never has been, about the bricks and mortar of that monstrous building on South Parks Road, it is about fighting for the rights of the animals who are destined to suffer and die within its walls in barbaric experiments at the hands of Oxford University researchers. And what we demand for these, and all animals, is simple; the fundamental legal right not to be treated as ‘things’, as property, or resources. Just as Felix was, so each animal inside the labs of Oxford, and elsewhere, is an individual; each has interests and each life matters, but as long as humans have property rights in animals they will continue to be exploited and there will be no effective sanctions to prevent their abuse. When the rights of the property owner, a human, are balanced against the rights of the property, an animal, the scales will almost always weigh in favour of the property owner. With this in mind, SPEAK is now ‘SPEAK – The Voice for the RIGHTS of Animals’ to emphasize what it is that we are fighting for; not welfare improvements or more ‘humane’ treatment but legal rights for and an elevation of the moral status of animals. Most animal abusers would profess to care for the welfare of animals who suffer at their hands in order to attempt to make their abuse more palatable to the public and no matter how large the cages in a lab, the animals inside still suffer psychologically and physically and have no control over their own lives. Their exploitation must be abolished, not merely regulated; this is the only way we will achieve real change for the animals. Oxford University ‘s horrifically brutal treatment of animals and total arrogant disregard for their rights has led to Oxford being seen as the capital city of animal abuse in this country and SPEAK’s focus will remain upon this institution and city until the appalling cruelty there ends. Until this happens, SPEAK and its supporters at home and abroad will continue to spread our message worldwide and encourage all people of conscience to boycott Oxford . As Oxford University and those who protect and support animal abuse in the government, police and the media continue their assaults on legal protesters who fight for what is right, so SPEAK increases in strength and sees support for the campaign grow by the day. Throughout the coming year, SPEAK will continue to challenge those who abuse animals at every opportunity and in every quarter. We will never be bullied or harassed into walking away from the animals incarcerated inside Oxford University . The lives of the animals matter to them, they belong to them and we will fight for their rights until every cage is empty.